Nguyen Thi Tuyet Dung pictured on FIFA’s home page. 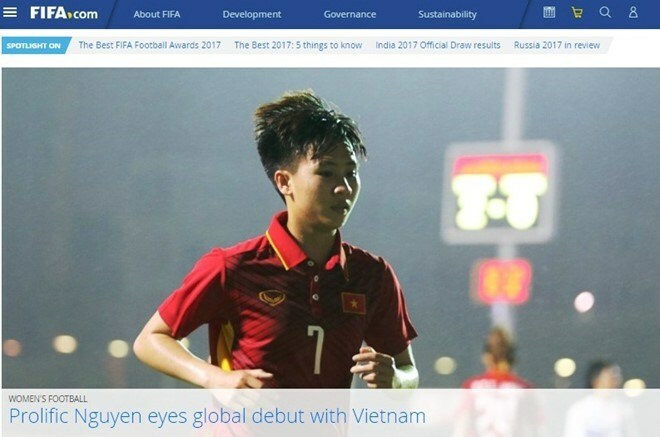 Hanoi (VNA) - Midfielder Nguyen Thi Tuyet Dung has been featured on the FIFA home page, in an article in which the world football governing agency appreciates her scoring skills. Dung is currently busy preparing with the national team for the 29th Southeast Asian Games and the final of the Asian Women’s Football Championship. “Nguyen Thi Tuyet Dung achieved the remarkable feat in a group match against Malaysia in the 2015 AFF Women’s Championship. That day, the youngster completed a hat-trick as her side, playing as hosts, thrashed the visitors 7-0. And she did more than just scoring from two corners, she did so with both feet,” the article said. After praising Dung’s incredible scoring skills, the piece went on to detail her career, her dreams and future plans. Dung, who idolises Cristiano Ronaldo, is satisfied with her performance in the Asian championship qualification games, where she scored four goals. Vietnam will play with eight other teams in the final round in Jordan next April. They will serve as qualifiers for the next FIFA Women’s World Cup in France in 2019. The top five teams will advance. Dung believes that Vietnam will not let this precious opportunity slip away for the second time. Vietnam missed its chance to play in the Canada World Cup when they lost to Thailand, despite playing on home turf. “We will qualify for the World Cup for the first time. It will be a wonderful experience for both me and my teammates. Because only by playing in the World Cup can we have the chance of competing against the world’s best,” Dung was quoted as saying on fifa.com.